Explore the world of instrument making with Brain Monkeys and the Sam Beauford Woodworking Institute. Students will make a soprano ukulele with a solid mahogany top. NO EXPERIENCE REQUIRED. Ukulele’s are one of the most popular instruments on the market right now, They are very easy to learn how to play, and due to the small size, they travel well. 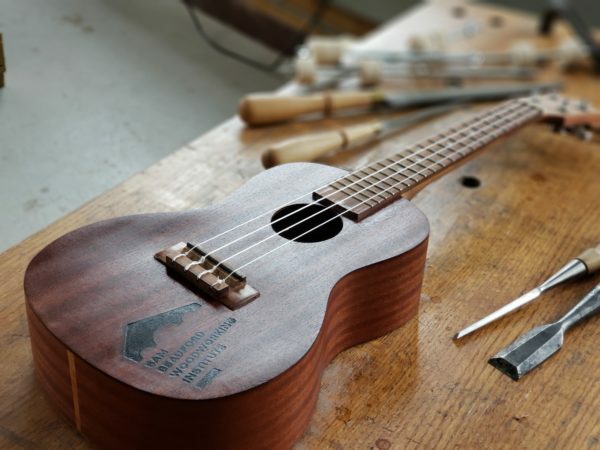 Building a ukulele is a great starting point if you are a new builder looking for that first project. The students ukes will be tuned and ready to play upon completion of the class, and Luke may even teach you a few chords. Wednesday: Optional Field Trip to HMI Hardwoods – Time TBD – Campers MUST RSVP if attending. Friday: 9am-2pm Registration: You MUST register by July 1, 2019. We need 12 students to run this camp, you will receive a refund if we do not meet our minimum number by July 1. Registered students will receive an information packet after July 1. There is no before or after care for this camp and students must pack their own lunch and snack. To register for this camp, please fill out the form below and submit it. You will then be asked to pay through PayPal. You do not need a PayPal Payment Account to use PayPal. You will receive a Camper Information Packet after July 1st and we have registered 12 students and are able to run the camp. Email Brain Monkeys at: info@brainmonkeys.com OR Contact The Sam Beauford Woodworking Institute by calling: (517) 902-8383 OR Filling out the Contact Us Form located here. This is the grade level the student will be entering in the fall. We like to know where are students are coming from, please let us know what school your child attends or if he/she is home schooled. This is the first collaborative camp between Brain Monkeys and The Sam Beauford Woodworking Institute. Here is more information about The Sam Beauford Woodworking Institute. The Sam Beauford Woodworking Institute is a non-profit 501(c)(3) organization located in Adrian, MI and incorporated on April 23rd, 2017. We provide woodworking classes for all ages, including job training, workforce development and rehabilitation services. The SBWI supports three types of people – students, hobbyists, and professionals. The facility is inclusive and open to all. Some work undertaken is considered pure art, while other opportunities are designed for students to gain employment. We provide resources to learn marketable and measurable skills that are valuable in both a personal and professional capacity.